The event you have selected has been completed and is no longer available! Visit this location on the My Community Directory website. Note, this opens in a new window. Leonard Aitken, Jan Allsopp, Nanette Backhouse, Matthew Begg, Stefan Bruggisser, Sara Bowen, Cher Breeze, Danielle Burford, Terri Butterworth, Amber Carbury, Jo Elliott, Ben Fayle, Sheryl Fisher, Rob Garrett, Guy Gilmour, Averil Harris, Adrienne Hmelnitsky, Nicholas Kachel, Jeanette Keough, Michael Langley, Violetta Lanza, Penelope Lawry, Georgie Lucock, Brentyn Lugnan, Josh Mackenzie, Lynne Mak, Gloria Malone, Raymond Mather, John Mawhinney, Tonya McIver, Bim Morton, Laurie Mossuto, Sarah Mufford, Julie Nash, Jenny Parkin, Sandra Pitkin, Will Price, Yvonne Quadros, Isabel Ricketts, Ray Rixon, Bronwyn Rodden, Jeramie Scahill, Tyrone Sheather, Jeremy Sheehan, Alanna Shorter, Jane Sturrock Nash, John Thiering, John Van Der Kolk, Peter Wade, Nick Warfield, Alison Williams, JP Willis, and Christine Wilson. Affirmations Publishing House, Alison Brown, Baringa Private Hospital, Bellbottom, Bryant McKinnon Lawyers, Camp Creative, CEX Coffs, CHCC Library Museum & Gallery Team, Coffs Coast Community College, Coffs Coast Screen Printing, Coffs Harbour Creative Arts Group, Coffs Harbour Surf Club , Coffs Harbour Surgical, Coffs Reiki, [email protected] Pty Ltd, Denis Atkinson Planning, Dr Jay Ruthnam, Emporium Bellingen, First National Real Estate, Fishburn Watson O’Brien Solicitors , Fresco Marketplace, Fresh Dental Care, G2 Architects Sawtell, GJ Gardner Builders, Ground Earth Café, Hand and Body Concepts, HQB Accountants/Auditors/Advisors, HQB Financial, Island Art Shop, Kerry Albert & Co, Locale Consulting, Mike Blewitt Ford, Moonee Tavern, Northside Health, Old John's Café, Oz Group Coop, Palate & Ply, Park Beach Plaza, Project Sisu, RJK Optometry, Saltwater Freshwater, saso.creative, Screenwave, Shortshank Pty Ltd, Split Café, Tech Edge, The Art Factory, The Majestic Cinema Sawtell, The Travel Centre, Uko Ono, Vivienne Crisell Designs, Wajaana Yaam Gumbaynggirr Adventure Tours. 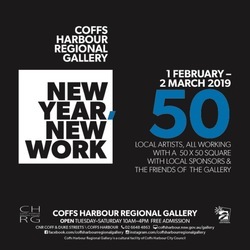 Coffs Harbour Regional Gallery is open 10am - 4pm, Tuesday to Saturday (excluding public holidays and the week prior to each new exhibition).